And it's coming to Early Access on September 15. “Oh, see that? He’s learning.” I laughed at the semi-sarcastic quip came from Larian’s Swen Vincke, since it made for a nice change of pace from his mantra during the first half of my hands-on demo with Divinity: Original Sin II—“Uh, hit F5 please,” prompting me to save the game in case everything went horribly wrong. Walk into an outpost guarded by profiteering bandits? “Hit F5, please.” Casually initiate a conversation with an unassuming NPC? “Hit F5, please.” Inevitably his voice would pop in from over my shoulder, Vincke’s foreknowledge of certain death struggling with his desire to let me play without restrictions. But I didn’t need prompting when I decided to go take on a pack (Are they a pack?) of eighteen-foot long alligators. That time, I hit F5 myself—much to Vincke’s relief. And mine, considering I was brutally murdered in the first turn. 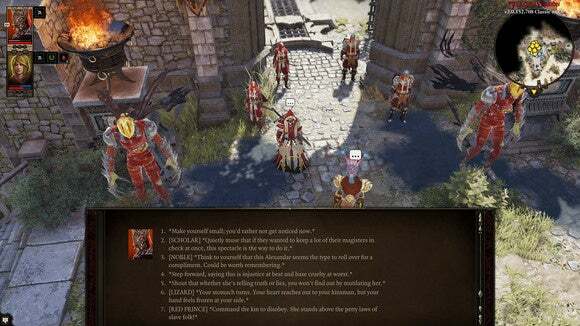 This was our first hands-on with Divinity: Original Sin II, and the first time I’ve seen the game since it was unveiled last August. And it was the real game, too. 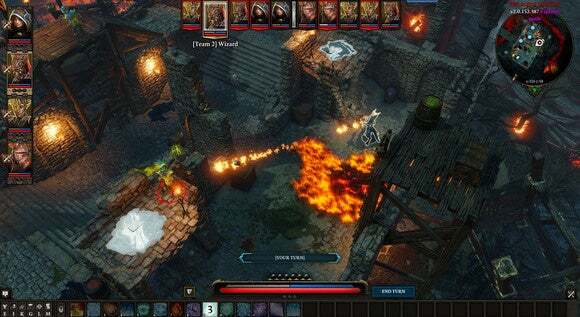 Where last year Vincke demonstrated some basic systems of the studio’s isometric CRPG follow-up but in a thrown-together prototype world, what I played a few weeks back in San Francisco was the opening chunk of the actual game, which is launching in Early Access on September 15. As you might’ve inferred from that intro, it packs the same bloodlust as the first Original Sin, one of the best PC games of 2014. I created my character (a battlemage—my first mistake) and picked a backstory for him, deciding on “The Red Prince,” a fallen lizard-prince who’s been betrayed by his family and exiled to distant lands. It’s one of the many unique pre-written “origin stories” you can roleplay as in Original Sin II, with certain extra dialogue options and attitudes specific to their upbringing. For The Red Prince, that meant the character-agnostic traits “Noble” and “Scholar,” plus a few specific to me personally—fellow lizard-people who were happy to see me toppled and my reign cut short, others convinced I could win back the throne. Anyway, after Vincke winced at my choice of battlemage (low initiative and low health, which meant I was targeted and killed early in almost every battle) I was dropped into the game alongside gun-for-hire writer Chris Avellone, who’s authoring one of these unique characters for Original Sin II. And that’s how ten minutes later I found myself on fire, roasting alive and watching my health bar plummet while Vincke said “Chris, do you have—can you rain blood on him?” And he did, and the fire I foolishly stumbled into extinguished itself under a heavy downpour of blood falling from the sky. 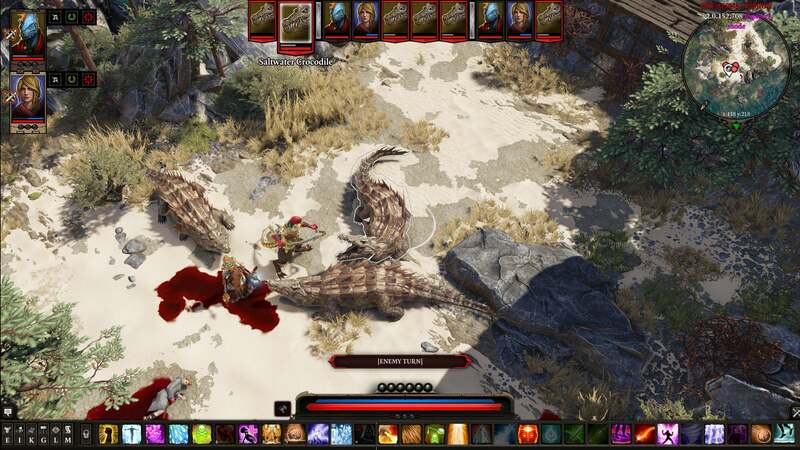 Divinity: Original Sin II is horrifically funny, in co-op. Seriously. I mean it. The first Original Sin was pretty great in co-op also, with players by no means required to cooperate in any form, but Original Sin II raises the potential for mayhem. It seemed like no matter what Avellone and I did, hell was bound to break loose. Take the eighteen-foot alligators I mentioned above. The reason we went after them? One of them swallowed a teleport stone, and a shady character told me if I retrieved it for him, the two of us could escape the prison we were in. Then the same shady character went and (unbeknownst to me) offered the same quest to Avellone. Had we defeated the alligators, the two of us would’ve been in a deadly struggle to secure the teleport stone and rush it back to the questgiver so that one of us could’ve escaped from prison, thus fulfilling the much-larger goal that arcs over this introductory chapter. Or maybe we could’ve killed the questgiver, taken his stone, and both of us could’ve escaped. Did I mention you can play with up to four people in co-op? More important: Did I mention the alligator who swallowed the teleport stone keeps setting it off accidentally in its stomach, disappearing and reappearing at random all over the battlefield? 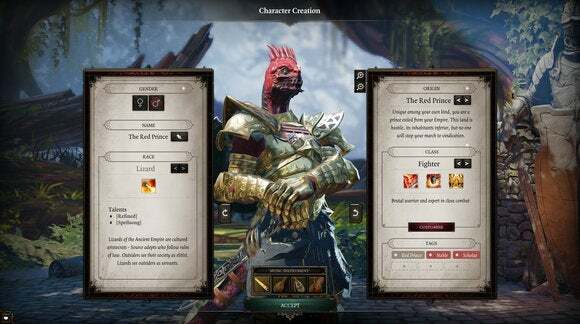 It’s the same sort of systems-driven insanity that made Divinity: Original Sin an instant classic, but expanded upon with a more coherent story and a more confident hand. Where the first Original Sin felt like an experiment, this feels like a “Yeah, we’ve got this” on Larian’s part. The game feels immediately familiar—with the same turn-based combat, lengthy written dialogues, and dungeon-crawling through vibrant landscapes—but expanded upon in a dozen different directions. More traits, more spells, more everything. And whether you engage with any of the multiplayer nonsense? That’s up to you. Personally I like having more control over my stories—doing every quest, seeing every story—than multiplayer allows. But it’s a hell of a lot of fun to run on the side, like getting together for tabletop Dungeons & Dragons (or Pathfinder or whatever runs to your specific tastes) and seeing how it all goes wrong. A trainwreck in slow motion. Just make sure you either play it with your best friends or complete strangers, because you’re bound to get angry when in the midst of mopping up some low-tier enemies your “friend” shoots a massive fireball into a crowd, setting your newly-found AI party member on fire. Then you’ll hear, “Uh...I think you guys are out of resurrection scrolls,” meaning your would’ve-been-pretty-useful party member is left to rot on the dungeon floor. For the less story-driven there’s also a new Arena mode, which I dabbled in briefly before my demo was up. It’s essentially the game’s turn-based combat, but a competitive tactics game. You choose from various pre-rolled characters, bring them into the battle, and square off to see who can make better use of the game’s systems. It’s a game of attacks and counter-attacks and counter-counter-attacks. For example: You cast a spell and set one of your opponent’s characters on fire. Your character is out of actions, so it’s the end of your turn. Their character then casts “Bless” on that fire so it heals them each turn instead of burning them to a crisp, and they drop a poison barrel on your second character for good measure. You then use that second character’s teleport abilities to swap places with theirs—meaning you’re now in the healing fire, they’re in the poison cloud. 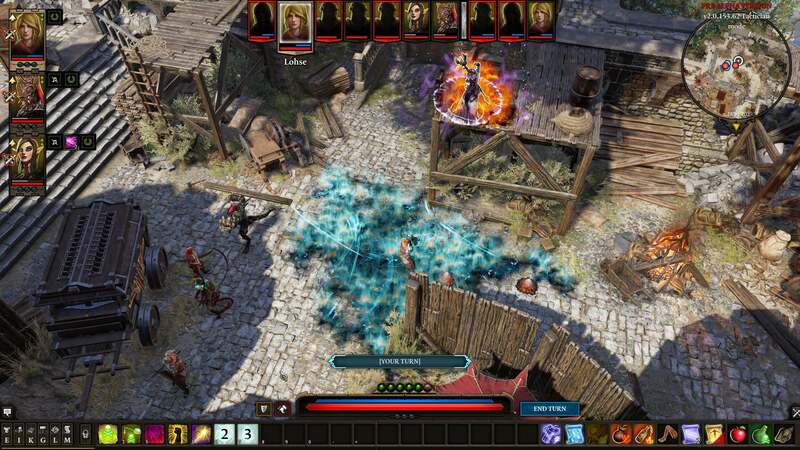 These sort of multiplayer experiences usually feel tacked on to predominantly singleplayer games, and I admit I internally rolled my eyes at the idea of playing Divinity: Original Sin II’s take on adversarial multiplayer. I mean, in an isometric CRPG? Come on. But I’m surprised how compelling it is, even in this early stage. Divinity’s singleplayer/co-op campaign is built upon so many interconnected systems, multiplayer feels like a consequence-free extension, a sandbox where you get to test the limits of Larian’s programming and also square off against someone more intelligent than the game’s pretty-decent AI. I think when I wrote about Divinity: Original Sin a few years ago, I said it was like the isometric CRPG we would’ve received in 2014 if studios hadn’t stopped making isometric CRPGs for fifteen-odd years. From my hands-on time with Original Sin II, I feel safe saying Larian’s upheld that legacy and then some. There’s something incredibly refreshing about a game that adopts the attitudes of 1998/1999—this “Yeah, go ahead and break the quest. Do whatever you want. Do what seems fun,” attitude that disappeared as games got more focused on players experiencing the story The Right Way. And sure, it’s chaotic. It’s unforgiving. But that’s why we have F5, right? 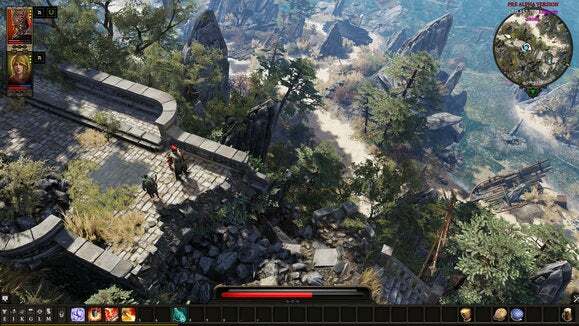 Look for Divinity: Original Sin II to hit Early Access on September 15.